Michael Radnedge has been a member of the financial services industry for over 17 years. Commencing in 2000, he has worked in a variety of roles within the sector. Michael holds a Bachelor of Commerce in Banking & Finance. He subsequently completed a Diploma of Financial Services in Financial Planning and joined the Financial Planning Association of Australia (FPA) where he retains AFP membership status. In 2006, financial planning firm Assure Financial Services was established, with an aim to provide quality advice on superannuation, investments, personal insurance and estate planning matters. Conscious that many people receive advice from firms aligned to banking and other financial institutions, Assure Financial Services is licenced with Blue Ocean Financial Services Pty Ltd, one of Australia’s leading privately owned financial planning groups. As a Blue Ocean adviser, we are able to provide comprehensive and robust advice suiting the individual needs of our clients. Michael seeks to provide clients with a positive experience when working on financial and strategic advice related matters, and frequently receives referrals from those for whom he has delivered outstanding service. 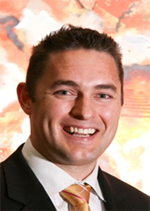 Michael is a Director of Assure Financial Services Pty Ltd, a financial planning practice that delivers strategic solutions to clients who are seeking financial advice on a fee for service basis. Our focus is to deliver high quality service and advice on a fee for service basis, this means you only pay for the financial services you agree to receive. Our services range across superannuation, investments and personal risk management as well as assisting as a facilitator on estate planning issues. If you are seeking the delivery of superior strategy focused financial advice, Assure Financial Services is here to provide it. Michael Radnedge and Assure Financial Services Pty Ltd trading as Assure Financial Services are Authorised Representatives of Blue Ocean Financial Services Pty Ltd AFSL 493361. Assure Financial Services Pty Ltd is an Authorised Representative of Blue Ocean Financial Services Pty Ltd ABN 17 615 108 177, AFSL 493361. Registered Head Office: 4 Grandis Place, Bateau Bay NSW 2261, Ph 1300 475 145. The information contained within the website is of a general nature only. Whilst every care has been taken to ensure the accuracy of the material, Assure Financial Services will not bear responsibility or liability for any action taken by any person, persons or organisation on the purported basis of information contained herein. Without limiting the generality of the foregoing, no person, persons or organisation should invest monies or take action on reliance of the material contained herein but instead should satisfy themselves independently of the appropriateness of such action.